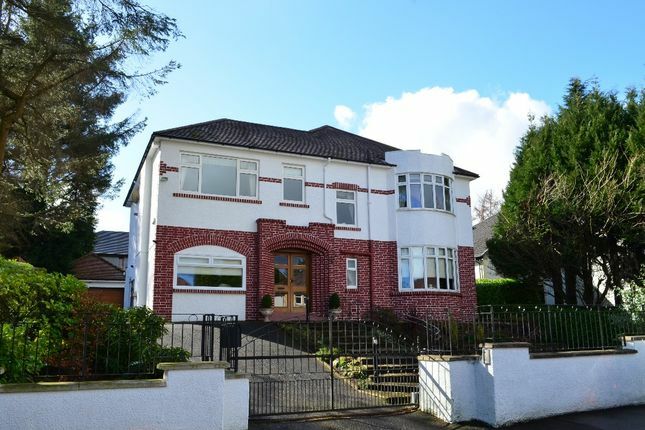 Higher Whitecraigs has long been regarded as an extremely sought after residential address within the Southside of Glasgow. Minutes from a fabulous selection of amenities in Newton Mearns and Clarkston, the area is made up of an interesting collection of up-market homes set upon attractive tree-lined streets. Roddinghead Road is one of the location's most revered addresses and number seven is an eye-catching 1930’s two storey villa with detached double garage, set within a very broad and well-kept plot. The home for sale lies within a stunning elevated plot which is held within attractive full-height fencing and accessed through automatic gate. The paved driveway leads up a gentle slope and passes the gable end of the villa, leading to the property's detached double garage with automatic door. The garden grounds are beautifully manicured and include a substantial family lawn at rear, sunny patio area and a stunning selection of mature plants, shrubs and trees. The rear garden enjoys fantastic exposure to natural sunlight throughout the day and is perfect for children to play in safely. The internal accommodation is of fantastic proportions, offers a floor area of 3003 sq ft and would be ideal for a growing family in search of bright and versatile family living space. The provided photographs and floorplan will give you a good indication as to the overall size and layout of the property, however in brief the accommodation extends to; storm porch, broad reception hallway with staircase leading off to upper level, guest WC beside front doorway, two front-facing public rooms, impressive formal dining room, substantial open-plan family kitchen with wonderful kitchen and food preparation area, dining area with patio doors to rear garden and further seating area, utility room with walk-in pantry, four spacious upper bedrooms of which one has en-suite shower room and another benefits from Jack and Jill shower room which is also accessible from main landing and a large family bathroom with four-piece suite completes the accommodation. EPC Band D.